These two brothers and their matching coats and lollipops just had "lucky" written all over them. 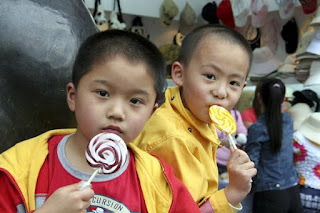 In China, under the one child policy, it is considered lucky to have a boy, but to have two boys is double lucky. And as if that isn't enough, they are wearing the colors of luck, and have lollipops to match. Of course, I had a feeling that posting this image and "telling it like it is" re: kids in China would stir some sentiment. The first comment I received on this post proved so. I agree. While this is by no means an effort to sugar coat the realities, I decided to add 2 more photos to this post, along with the story behind them. Well, what really caught my eye other than her contagious smile was the person holding her. Of course, it was he whom I asked permission to photograph his darling girl. He replied with a thick Spanish accent. Turns out he was the newly adopted father for this little Chinese girl. He and his wife came from Spain to adopt her, and were spending some time traveling the country with their new daughter. I have rarely seen a father exuding so much love as this man. When I commented that she is so lucky to have been adopted by such a loving parent, he replied, "no...I am the lucky one." Be sure to check out Delicious Baby for more takes on Photo Friday! And follow this link to see a whole gallery of China images. These kids ARE precious. I hope, however, that one day the girls of China will be considered just as lucky. Thank you for your comment, and as I suspected when I first posted just the one photo...the story was incomplete. So I have added to it, some photos and story of a Chinese girl who happened to be very lucky too. Nice addition to your post. Hearing of a child who just found a good home is always something to be thankful for. Beautiful photos, and the story of the little girl is especially beautiful. So nice to know she will have a loving home.